…attached to a 12-inch diameter telescope! 8-inch Dobsonian, and some smaller scopes for experimentation. However, my most prized possession is my 12-inch Meade LX90GPS pictured on the left. It cost a small fortune, but is an absolute beast that allows observing deep sky objects with relative ease compared to my smaller scopes. Sadly, the sheer size of the thing means its totally impractical for me to easily move around whilst working abroad. Factoring in the heavy tripod, a case of eyepieces/leads/filters, and some other less-useful accessories, it quickly becomes a huge headache. The overlapping region of the Venn diagram depicting “At Home In UK”, “Free Time”, and “Clear Skies” is extremely small, leading to a highly limited number of days when I can go observing with the 12-inch. 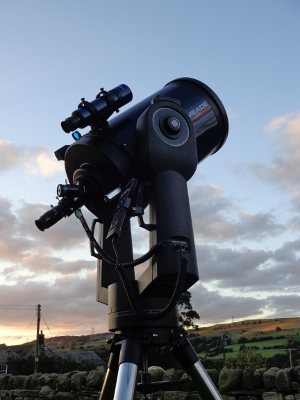 Spending the weekend with friends in a countryside holiday cottage in the UK’s Peak District gave the perfect opportunity to return to some amateur astronomy with this telescope. Luckily, the usual British (i.e. damp, grey, and overcast) weather cleared for one day and night and we were able to observe some stuff. We first turned the scope to the Moon, which is currently at perigee and may appear 14% larger and 30% brighter – the so-called Supermoon phenomenon. 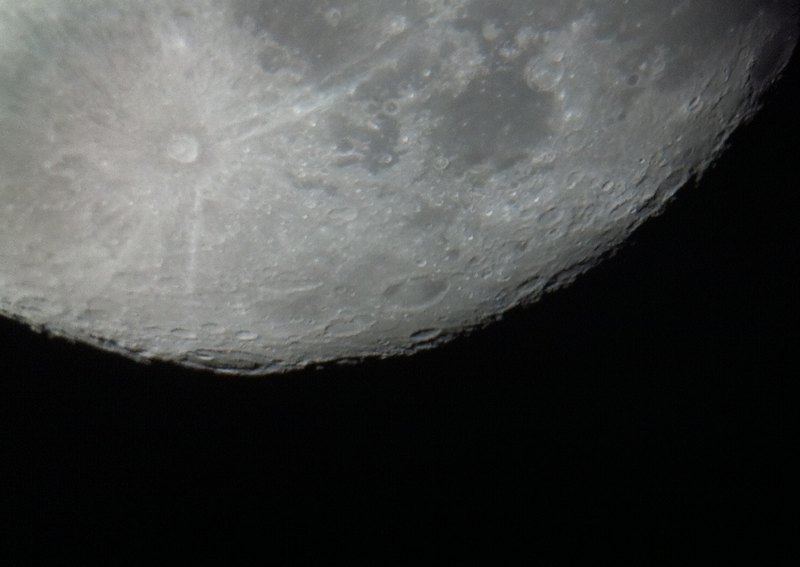 With a 26 mm Plossl eyepiece on the 12-inch, the entire surface of the Moon does not fit in the field of view. However, the level of detail available due to the magnification is amazing. The Moon was not quite full, giving the craters towards the edge a three-dimensional appearance that contrasted with the flatter plains across the disc. 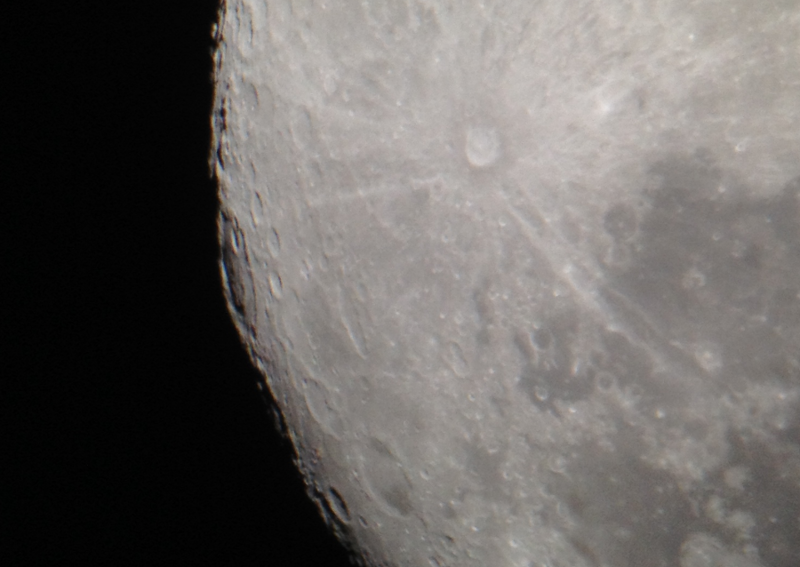 We zoomed in using 9 mm and 6 mm eyepieces, studying individual craters. My friends wanted to take some photos to capture these beautiful views. In the past, I’ve wasted many hours trying astrophotography. 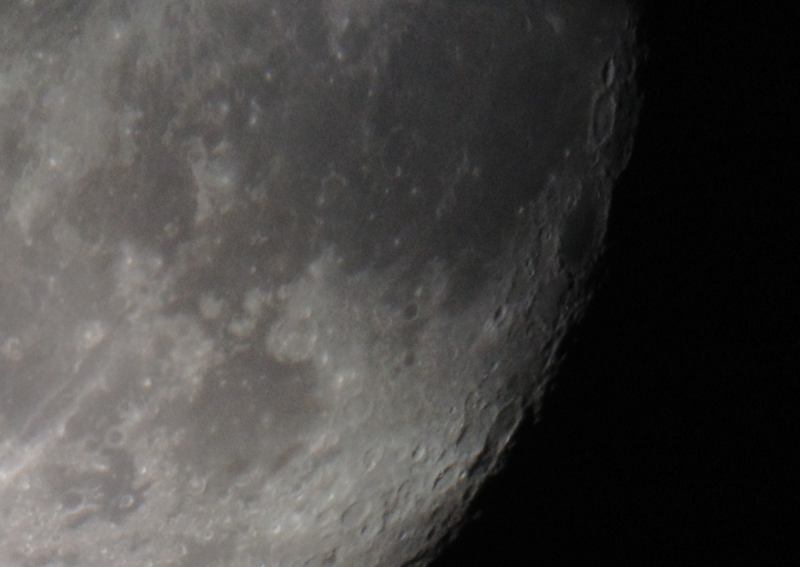 I could never afford a digital SLR camera, and instead tried a variety of cheaper alternatives including modified webcams and the Meade Planetary Imager, with limited success. We tried piggybacking a Sony compact digital camera, but we couldn’t seem to focus the image on the camera CCD. 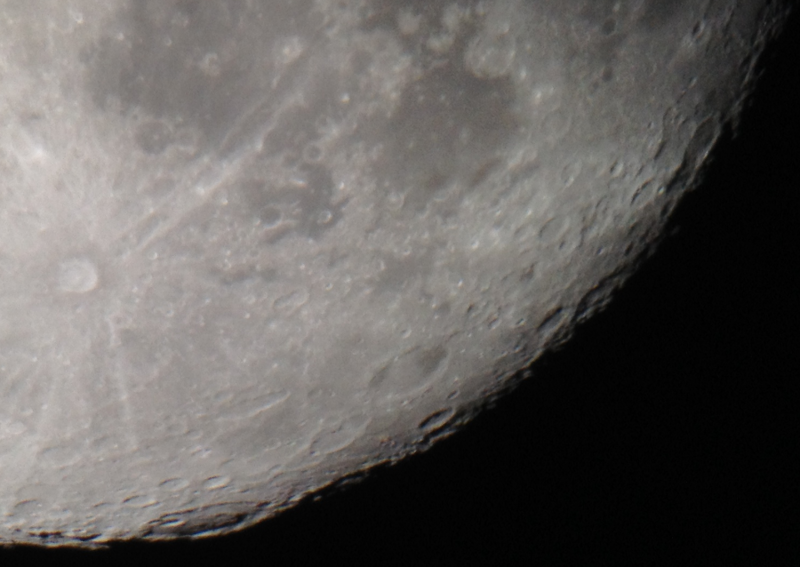 Interestingly, our iPhone 4 and 4S models were not only able to quickly focus on the image at the eyepiece, but also adjust the contrast to avoid saturation from the bright moon. Some of our better results are shown below – I find they seem to nicely capture the curvature / spherical nature of the Moon, which so often appears just as a flat circle in the sky. 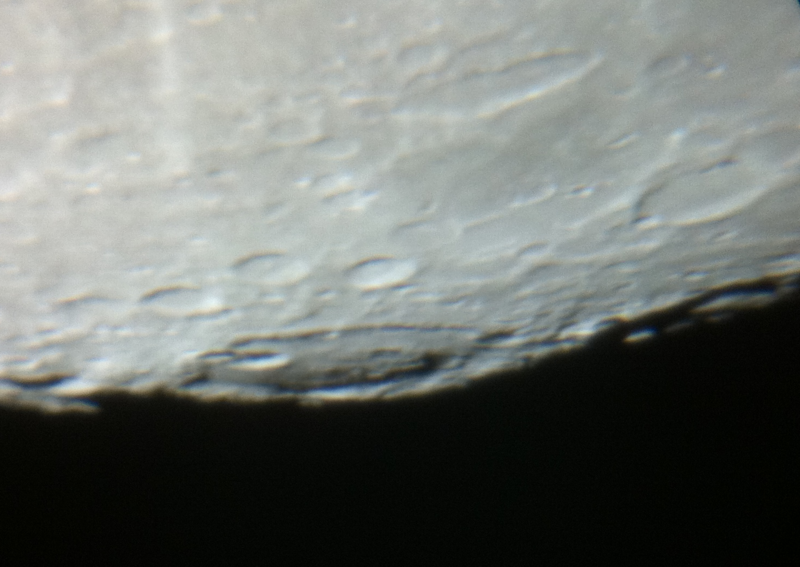 The images are mostly centered around the Tycho Crater, Mare Nubium (Sea of Clouds) and Mare Humorium (Sea of Moisture). Amazing what you can do with your mobile phone these days. After a few hours, I spent some time locating and observing the Hercules globular cluster (M13), which appeared as a fuzzy blob, and the Andromeda Galaxy (M31), which appeared as a larger fuzzy blob. Afterwards, however, the observing was cut short – I had forgotten the dew shield to protect the telescope from moisture and the lens was fogging up with condensation. D’oh! Click on each image below to see the full size version.